Beware the friend who hogs the microphone. Back in college, I threw a pool party at my parents' house. (I had permission, chill out, chill out...) To make things a little more interesting, we rented a karaoke machine. Now, I don't know if you've ever experienced your friends around a microphone when they're in a safe, judgment-free zone, but suffice to say, weird stuff happens. Holding a mic when their confidence is high just ... does stuff to people. One of my friends in particular quite literally refused to give up the mic. He sang a bunch, then just plopped down in a chair and began commenting on the world around him. He was our own little Kanye West at an awards show, and just about as welcome. And when we asked him to stop, he'd simply shout over us: "I have the mic! I have the power!" Over and over again. Since launching my podcast, I think about that moment every so often. I'll lean into the mic and think about how much I can or can't influence the resulting show. Is it really all me that makes this episode good or bad, or are there other elements to make it memorable for listeners? How can I give people a reason to start listening? What about FINISH listening? Will people just want me to shut up and put down the microphone? To illustrate how rare and difficult this is, and to avoid any risk of offending others, let's just use me as the example: Nobody gives a flying fig about anything I say based solely on my name. I don't have enough Twitter followers, give enough keynote speeches, or launch/invest in enough companies. I am not "business world famous." I'm also not one of those "famous for being famous" people on Twitter. So launching my show on the merits of my name alone would fail miserably. I can't win using this approach, nor can most people. Since most of you are content marketers, I'll just assume you've heard of Jay Baer and Joe Pulizzi. Each of them host podcasts. Jay hosts SocialPros, and Joe hosts This Old Marketing with colleague Robert Rose. In both cases, the shows take advantage of hosts with big followings and well-known names in the marketing world. And while Jay does bring in some big-name guests (we'll get to that in a second), his show is primarily known as "Jay Baer's podcast" to others. Joe and Robert, on the other hand, currently avoid using guests altogether, choosing instead to talk shop themselves and rely on their names for awareness. And it works. The Jay Acunzo Show would gain neither initial listeners nor loyal fans in the face of other, bigger-name hosts ... so when I launched, this approach was immediately off the table. Another very common way to win attention and be memorable is to invite well-known guests to appear on your show. While big-name hosts will often use big-name guests, this is still an approach that can stand alone. Back to me as the example to avoid being rude: I may not have a big name, but I could certainly appeal to an audience if I could somehow reach and interview semi-famous guests. And those semi-famous guests, if they're busy execs at my company, are much more likely to appear on a single episode to answer a few questions for 5-10 minutes than they are to host their own show. Like #1 above, this is also incredibly common in the podcasting world. It's also a tried and true tactic in content marketing across any medium: Find someone with audience (the proverbial "influencer") and interview him/her in order to tap into a larger network of followers. If you were hosting a podcast on content marketing, for example, and interviewed Jay Baer, Joe, and Robert, it'd be a smart move -- they're known names with big personal audiences. There's a great, relatively new show covering Boston's tech startup world called Tech In Boston, hosted by Dave Gerhadt. Dave's a smart entrepreneur and a good host. As a new show and new host -- and as an entrepreneur who lacks the big-name appeal of some others in the ecosystem -- Dave's done the smart thing by bringing on regular guests that people in town will recognize. To date, he's interviewed several well-known Bostonians in the local tech ecosystem, including Cort Johnson, Mike Troiano, Dennis Keohane, and Meghan Anderson. If you're in Dave's target audience (Boston tech entrepreneurs and employees), you either know these names or know their companies. Now, before I make my larger point, it's worth noting that Dave does a great job with his guests -- the conversations are natural and informative, and you almost always feel like you're sitting with them. That's no small task as a host. Because this type of show is fairly common, audiences can easily compare/contrast your show to other, more professionally produced interviews. If they're used to listening to ESPN and NPR hosts conduct interviews to various epic guests, with both sides participating in a charismatic, engaging way, you're now playing in that same ballpark in a listener's mind. And I don't know about you, but I'm just not that good. Because an interview-based show's episode headlines are often the name of the guest, it puts the pressure on the host/producer to find well-known guests consistently. That can be difficult, since again, these are busy people pulled in millions of directions. Aaaaand scene. Rinse and repeat. But worse than all that ... this is just BORING!!! What's glaringly obvious with too many business podcasts is a lack of post-production work and, even more so, a lack of what I call "segment thinking." Segment thinking is essentially your ability to view a creative project not like one whole but as smaller parts that you can mix and match to create the whole. In other words, you divide the entirety of the project into segments. At some point, I'll write a whole post on segment thinking. For now, as a podcast host, just know that you have a tremendous opportunity to take a lump of clay (audio content) and mold it in any which way you so choose. You can plug in stable, longer sections like interviews, then mix and match experiments around that until something sticks. Maybe you end with a bad joke every week. Maybe you open with a similar format. Maybe you do something weird and quirky that loyal listeners anticipate, making them feel like insiders and thereby strengthening that loyalty. Along these lines, when I launched Tech It Forward, I decided to have some fun with the segments and the content. In my first episode, for example, I did a basic interview for most of the show. But I also introduced a segment near the end to experiment and also to snap listeners back into the moment after several minutes of interviewing. The segment is a word game which puts my interview subject on the spot. This forces you to pay attention again by changing the pace and introducing a new element to the show, which is particularly important late in the show when you may drop off. Podcasting is much more wide open and ripe for the taking than other mediums, especially if you're talking business. Podcasting is not only less saturated for content marketers, it's done less creatively (see mini-rant about boring show formats above). Creative tends to be the last seat at the table in any content marketing medium -- a mentality I blame black hat SEO for. People just want to game a system until that stops working, then do it "right." But if you can genuinely give a crap and focus on your podcast's content from the start -- and leave everyone else to fight over approaches #1 and #2 and eek out a handful more listeners by over-marketing it -- then you'll actually have a chance at turning some heads. Blunt confession: This is much harder than any project I've ever tackled. I feel strongly that it's worth doing this show in a different way than other podcasts because I think THIS is how I can stand out. I also don't love the idea of "best practices" when it comes to content. Best practices are for programmatic, robotic, "stuffier" marketing ideas like banner ads and email optimization. Following most best practices when the goal is creating content? That's just doing what everyone else is doing, and that makes your job of standing out much, much harder. Better to find unique practices. How? You need to be more inventive. You need to pull from inspirational sources outside your own industry. You need to take creative risks. That's hard, isn't it? But as Rob Go, founding partner at my firm NextView Ventures, likes to say, "The hard is what makes it great." And to me, being great in podcasting means more than just attracting people who listen to my show. It means attracting people who REMEMBER IT. And shouldn't that be the point of everything we do? 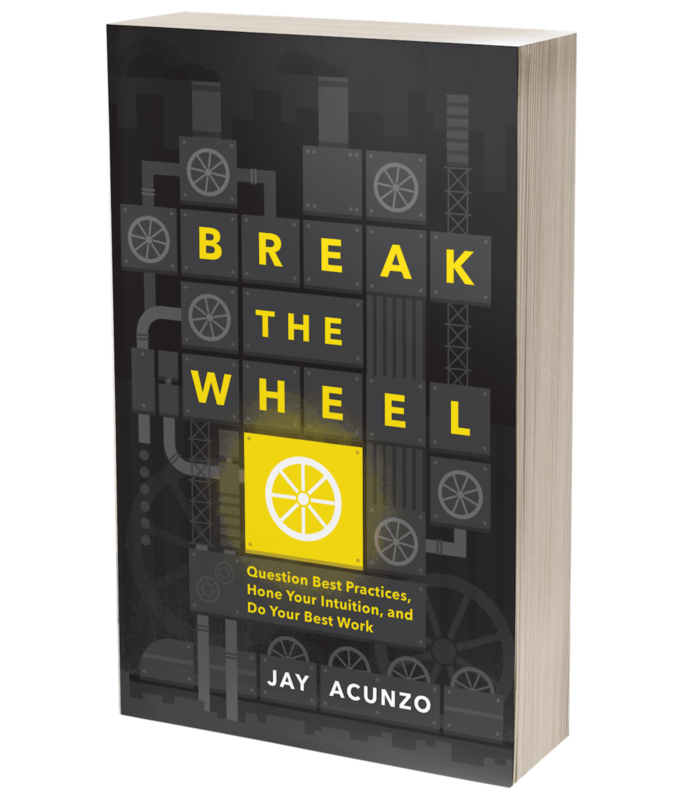 Posted on September 25, 2014 by Jay Acunzo and filed under content marketing, creativity, podcasting. As my wife would begrudgingly admit, I'm an absolute sucker for pretty much any computer animated film. A Bug's Life? Great. Finding Nemo? Grand. The Incredibles? You guessed it -- it was good. Toy Story? To infinity and my DVD player. Ratatouille? Rat-tat ... uh ... um ... alright, French is kind of where my wit taps out. HOLD ON I'M GOING SOMEWHERE WITH THIS! Remember in the movie Up, when the the talking dogs all break from mid-stream conversation to yell, "SQUIRREL!"? (Of course you don't. You're an adult with a life outside animated films. But I LOVE that joke, and you can watch an example here.) Anyways, I could easily be accused of having the same propensity for the furry object sprinting by me. I like the prospect of the new. I like side projects, creative exercises, and pre- and post-work events. So it's no wonder that I launched a community group a couple years ago to go along with my already demanding day job. The group is Boston Content, and I'm proud to say (and honestly never thought I'd say) that we have 600 local members. Enough with the Intro: What's This About Free Content Marketing Help? As our group grew, it became clear the community members genuinely loved hanging out and learning about content and creativity. So on Friday, September 19, we're throwing a huge creative bash along with Wistia, Eventbrite, Skyword, Hill Holliday, FutureBoston, and VentureFizz. It is, without question, the scariest and most exciting moment in my time running Boston Content with my co-founder, Arestia. Anyways, in support of this event and this community, as well as to hopefully continue to spread the content and creativity love, I'd like to give away some time, effort, and writing and/or consulting. To find out how it works, either watch the video or read the details below it. Buy 3 or 4 tickets as an individual or non-sponsoring organization, and I will write a blog post for you or your company. There can be multiple winners here (and for #3 and #4 too). The post's topic can be anything. It can be in my voice/byline or your company's. If your topic is not in my wheelhouse (which is marketing/tech/startups/writing/creativity), I'll do the necessary research to create the post as I would if I were working for you full time. If you purchase between 5 and 7 tickets, I'll spend an hour and a half with your company to help move your content marketing strategy forward. Again, there can be multiple winners here -- it's for anyone who fulfills this requirement. For 10+ tickets from you or your organization, in addition to at least a few hugs from me the night of the event (I'm Italian - it's what we do), I'll write a blog post for you and also spend 3 hours consulting your company on your content marketing. This will likely be spaced out over multiple sessions, but we can discuss exact details. For instance, across 3 hours, it's more possible for us to collaborate on a larger project like an ebook/guide or SlideShare, in addition to talking strategy. Okay, I'm In. What Do I Need to Do? Follow the instructions listed above. Forward me your Eventbrite ticket confirmation email (send to jason.acunzo@gmail.com). This part's important so I can figure out which tier you're in the running to win. I'll coordinate with the winners after Sept 19, in order for every participant to have a chance leading up to the party. Attend the event. Eat, drink, and be creative! Yes. If you're reading this and you're either a current or future member of Boston Content: THANK YOU! Arestia and I launched BosCon over coffee to just have more discussions around where our careers and our friends' careers were headed. I never thought 600+ people would join us from around the Boston area. We've hosted more than a dozen events and have shared hundreds of emails and tweets with the community group. It's been ridiculously fun and unbelievably humbling. So -- without motive or agenda -- thank you! You absolutely rock. 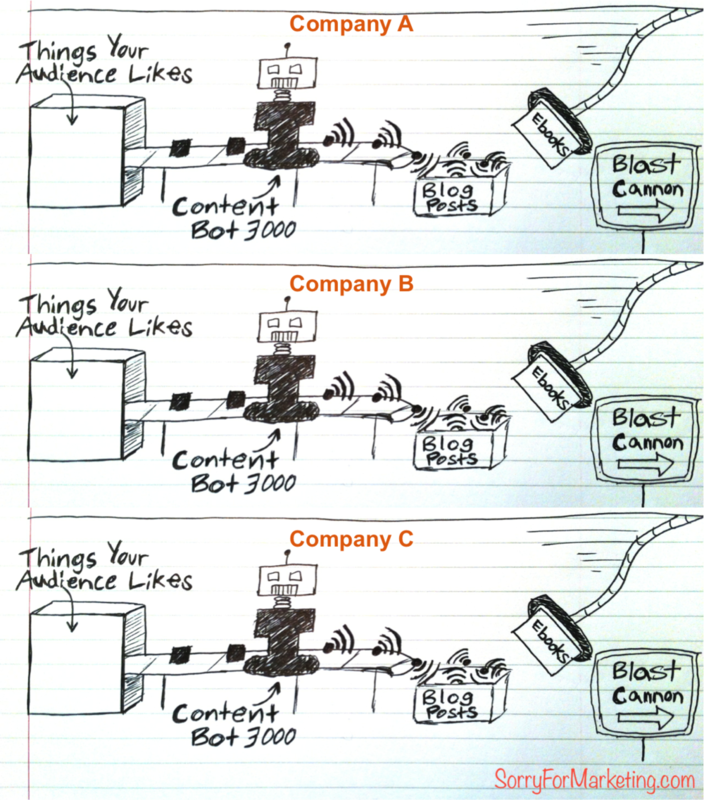 Posted on September 7, 2014 by Jay Acunzo and filed under content marketing, creativity. I'm a big believer in a little secret about content marketing. That secret, whether the pundits want to admit it or not, is that this style of marketing favors creative types. The more naturally creative you are, the better you are at this stuff. That should be obvious, right? Being a better writer (or designer, or videographer, or podcaster, etc.) probably increases the odds of you being prolific and creating things that people actually care to consume. You enjoy it, so you do it more, you refine your skills, and you view content production as something to do for the sake of doing (it's intrinsic) versus an activity to efficiently move through to achieve an end result (extrinsic). It's also harder to be really creative than it is to be great at marketing. Whenever I've hired content marketers in the past, I've looked for candidates who can write or create really well over those who are super knowledgeable about marketing. Why? I can teach marketing in a much shorter span of time than I can teach writing or creativity -- if the latter can even be taught in an amount of time that aligns with business's frenetic pace today. But you won't hear this idea proclaimed all that much in the industry. That's because people who sell content marketing-related products or services can't really declare this to be a practice for the creative few. They're far better off selling to a broader audience, and so the dialogue runs that everyone can be great at content. Maybe. I get why they say that. I'm just not sure I believe it. Now, I'm not saying content marketing can't produce some results for your more traditional marketer types, but rather, that understanding creative production is important. Really focusing on the stuff that happens after your marketing falls away and all that's left is your creativity and your knowledge is the difference between someone who's great at content marketing ... and someone who's just great at generating empty pageviews. In other words, conversions -- whether you define that conversion by looking at qualitative, positive sentiment or through marketing metrics like subscribers, leads, customers, and so forth -- happen AFTER THE CLICK. So where your audience spends time after the click (i.e. with your content) better be damn good. So, um, can we start talking more about creativity and quality behind what we physically produce? And not just focus on distribution alone? Please? Okay -- enough of the rant. Again, that's a bigger post for a bigger debate down the road. The reason I started with that is to make it clear that the parts of a blog post that happen after the headline actually, truly, deeply matter. Like, a lot. A buttload. A metric crapton. Why It Matters: The aforementioned hyper-distracted nature of our world. Also, people often share blog posts based on the intro alone, says Chartbeat via Slate. Example: Everyone thinks blogging is about being a thought leader. They’re wrong. This is a term that journalists use to describe a paragraph ("graf") that gives you the who-what-where-when-why of a story. For your marketing purposes, it could be a combination of these or simply the thesis or main takeaways that you’ll explore later in the post. The goal is to say to your reader early in your post that THIS is what I am about to prove or THIS is what you need to know, and let's dive in and learn more about that during the rest of the post. Why It Matters: For you search rank lovers out there, I'm pretty sure there's a benefit to laying out the critical info and learning (i.e. keywords) up front. For you aspiring or established quality writers out there (my people! ), you want to deliver value up front to the humans you're trying to reach ... since you're writing for them, not for bots. Example: The best corporate blogs focus not on being thought leaders but on being simply but consistently helpful to their target buyers. The body should be a combination of stories, data, and other points and opinions to logically support whatever your nut graf/thesis said to be true. As a general rule, the longer the body, the more visual breaks or subheaders you should use to keep readers engaged. If you want to adopt a single approach, try to work in at least three points into the body of your post that support your thesis. Why It Matters: Because this is, um, most of the content in your content. Example (condensed): Helpful blog posts (1) rank well on Google, (2) drive trafﬁc over time (instead of relying on viral luck), and (3) address the same problems as your product, helping you reel in qualiﬁed trafﬁc. This is where you add tons of value and showcase your expertise by adding a few key takeaways. Why It Matters: To quote many people before me: "Tell 'em what you're gonna tell 'em. Tell 'em. Tell 'em what you told 'em." Example: So the next time you blog, instead of being clever or trying to force brilliance or virality, just answer customer questions and offer practically useful advice. This is where a central, core resource comes into the picture. The classic B2B example is an ebook, but there are dozens of other options. (Shameless plug: That is the subject of my talk at Content Marketing World this fall on 9/10.) If you run the content marketing playbook properly, all your blog posts are inspired by and relevant to some kind of content that inspires an action from your audience, whether that's to engage further or to convert in some way (e.g. lead-gen or subscriber-gen). Why It Matters: This CTA is critical to proving your ROI. At best, you will hit your main goal, like leads, subscribers, demos, etc. -- but at very least, the content to which the CTA links will add way more value to the reader and thereby generate more sharing, more emotional affinity, and future readership. Example: Ready to get started? Read more tips for great blogging (and for executing your content marketing when resources are tight) in this Content Marketing Growth Guide -- built to be less reading, more doing. An ongoing defense and exploration of quality and creativity in content marketing. Read for the ideals, stay for the sarcasm. Posted on June 27, 2014 by Jay Acunzo and filed under content marketing. If you want to skip the introduction and head right to the blueprint to execute your content marketing, click here. There's a word I learned when studying game mechanics for a past startup job used to describe the motivation behind your actions. This term sits squarely over everything I do today in content marketing. A telic action is, essentially, a chore. It's an action done for the end result alone. You probably sweep your floor to get a clean floor, not because you enjoy the act of sweeping and cleaning (and if you do, it's likely because you're thinking about that end result). Sweeping your floor is telic, at least to most people. The phrase telic has stuck around in my life long after leaving that game mechanics-focused startup. In content marketing, for instance, I've realized that not everybody views content production the way I do. To many, especially those from demand-gen or traditional marketing backgrounds, the act of creating content is a necessary evil to get an end result. It's a telic act. If it's not blogging, it's some other tactic -- whatever it takes to hit our goals. Thus, while creating content may come naturally to those who love writing, to those who view it as a chore, the process may be less intuitive. The same could be said on the opposite end of the spectrum -- distribution of your content can be a chore to creative types. The page also links to another resource -- a collection of three, two-page summaries from talks given live at NextView by HubSpot, Wistia, and Price Intelligently, detailing their content strategies. To grow audience, turn the wheel. I tried to visualize the entire process of content production and distribution as a wheel, which you can turn over and over again and refine as you go. You start in the middle with a single resource, then proceed from the top-left and around the wheel. The wheel is also supported at the top and the bottom by some initial planning to make sure your strategy actually works. At the top is where you list your main goal and how you plan to measure that goal. At the bottom, you'll walk through setting up a few necessary things that support and accelerate your work. Personally, for whatever it's worth, I'd be lost without this visual (which, again, I refined over time and expect to keep refining). Whether or not you're a startup, and whether or not you find this stuff to be "telic" (a chore) or "paratelic" (enjoyable), this playbook should help. Hacks to help you move faster without skimping on quality. Interviews with entrepreneurs who have found success, perhaps against the odds, with content marketing. Sneaky-good tools and content distribution tricks. What you WON'T find inside are pages and pages of theory. The motto behind this guide is "less reading, more doing." The resource is about actually executing your work, rather than thinking about how to get stuff done...then needing to figure out how in the world to go do it. (It's entirely form-free -- I don't ask for any of your info and no marketing will follow your download). Posted on May 27, 2014 by Jay Acunzo and filed under content marketing.